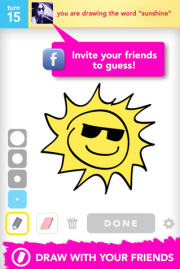 Draw Something, the popular mobile and social game where you and a friend guess the word the other tries to convey in a drawing, is reportedly coming to prime time TV as a game show. If it happens, celebrities and regular people will show off their artistic skills -- or lack of them -- in front of a studio audience. And here’s the part millions of Draw Something users will especially like: Home viewers will be able to compete against celebrities for a chance to win prizes. Variety reportsthat the show will air on CBS and one of the executive producers will be Ryan Seacrest, host of American Idol. While the supposedly upcoming show is a testament to the popularity of the game, which surpassed the 50 million downloads mark in April, it’s not the first drawing game for television. During the ‘80s and '90s the syndicated shows "Pictionary" and "Win, Lose or Draw" had stints on the small screen. Even so, by including a social element that lets viewers interact with on-air players using their mobile devices, Draw Something for TV looks to be different from its predecessors. It also could drum up interest in the game. As TechCrunch points out, traffic has plummeted ever since social game-maker Zynga acquired OMGPOP, the developer of Draw Something, in March for $210 million. Game-makers are certainly interested in capitalizing on the success of social games. Last year, 20th Century Fox TV lent its characters to a version of "Angry Birds," Disney created its own game, "Where's My Water?" and Zynga recently signed a licensing deal with Hasbro to bring popular brands like "Farmville" to toys and other goods.